Bheir Urras Àird nam Murchan baraill de dh'uisge-bheatha do dh'òganaich na sgìre nuair a ruigeas iad aois 18 bliadhna fo phròiseact àraid ùr. Tha an t-Urras an dòchas gum bi seo na chuideachadh ann a bhith a' brosnachadh na h-eaconomaidh agus gus daoine a chumail san sgìre. Tha cuid air an sgeama a chàineadh ge-tà. Ceannaichaidh an t-Urras baraillean de dh'uisge-bheatha bhon taigh-staile ann an Àird nam Murchan às leth gach òganaich san sgìre eadar 10 agus 17 bliadhna de dh'aois. Image caption 'S ann aig an taigh-staile fhèin a dheadh na baraillean a chumail ge-tà. Nuair a thionndaidheas iad 18, bidh an uairsin cothrom aca am baraill a reic air ais ris an taigh-staile, 's thèid na prothaidean a chosg air foghlam a bharrachd no trèanadh dhaibh. Gheibh iad cuideachd eòlas air gnìomhachas an uisge-bheatha. Thèid na baraillean iad fhèin a chumail aig an taigh-staile ge-tà. Tha an t-Urras an dòchas gum bi an iomairt na bhrosnachadh do dhaoine fuireach no tilleadh dhan àite, agus gun toir e togail dhan eaconomaidh ionadail. 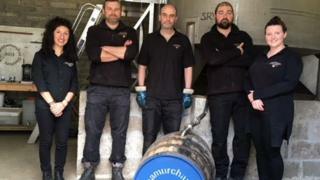 Thuirt a' bhuidheann Alcohol Focus Scotland ge-tà, gu bheil e mì-chùramach an sgeama seo a chleachdadh ann an oidhirp an eaconomaidh a bhrosnachadh, gu h-àraid nuair a tha iomairtean a' dol gus an droch bhuaidh a th' aig deoch làidir a lùghdachadh.